While the folk of Blighty may get a little cheery when the yellow hoods of daffodils emerge or when trotting amongst bluebells, there is no comparison with the elation felt by Japanese when the cherry blossoms begin to bloom in March. Not only are they a beautiful symbol of the changing seasons, of Japan and to many, life itself, but they also represent an excuse for a massive nationwide party. This is the time societal pressures fall by the way side, like blossoms falling into a flowing river. 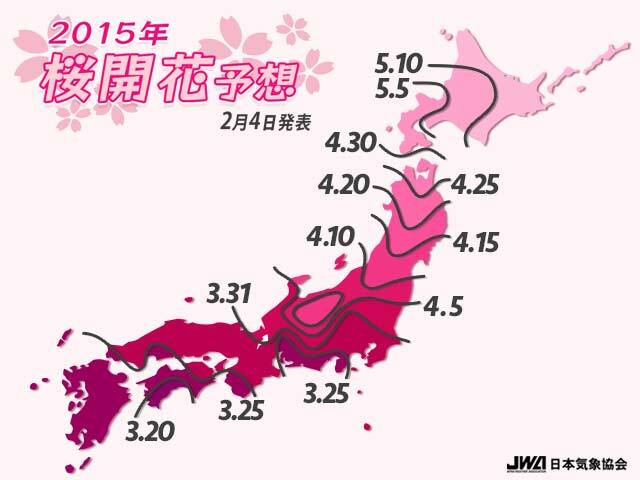 As you can see, the cherry blossoms are set to rain down on Kyushu in late March, whilst Tokyo will see its share of the pink stuff around 5th April. This wave of sakura passes through the whole of Japan, making the already gorgeous scenery shine even brighter with ethereal wonder. 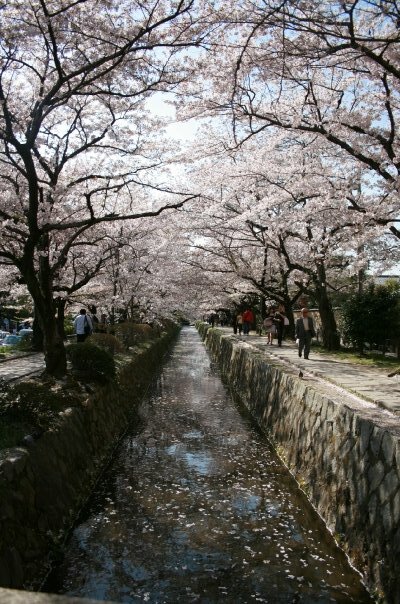 Let’s take a look at some cherry blossom hot spots in Japan. 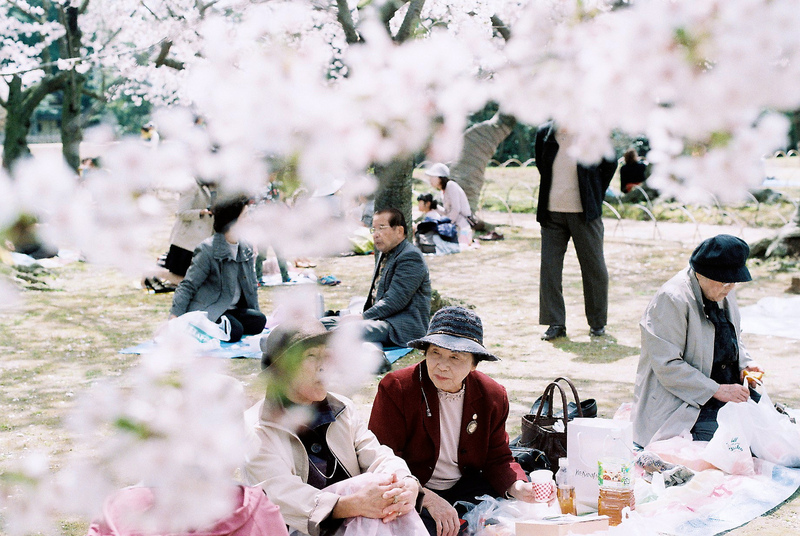 Hanami translates as ‘flower viewing’ but has come to mean the act of picnicking under the cherry blossoms. This is done throughout Japan and can become quite boisterous, though these ladies in Hiroshima seem very serene (for now). Sakura splendour frames the famous “Philosopher’s Path,” an ancient walkway in Kyoto. 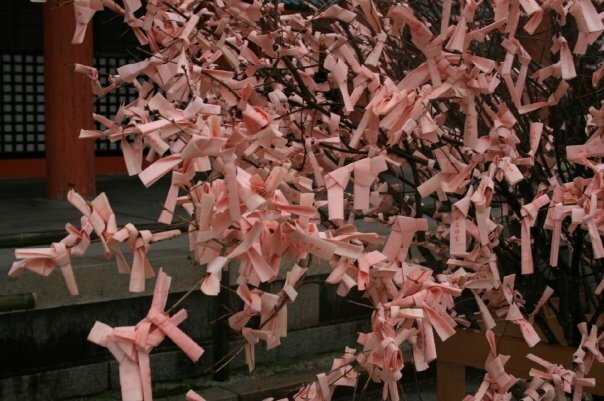 During cherry blossom season, pink fortunes called omikuji are picked and tied to trees, with beautiful results as seen here in Kyoto. 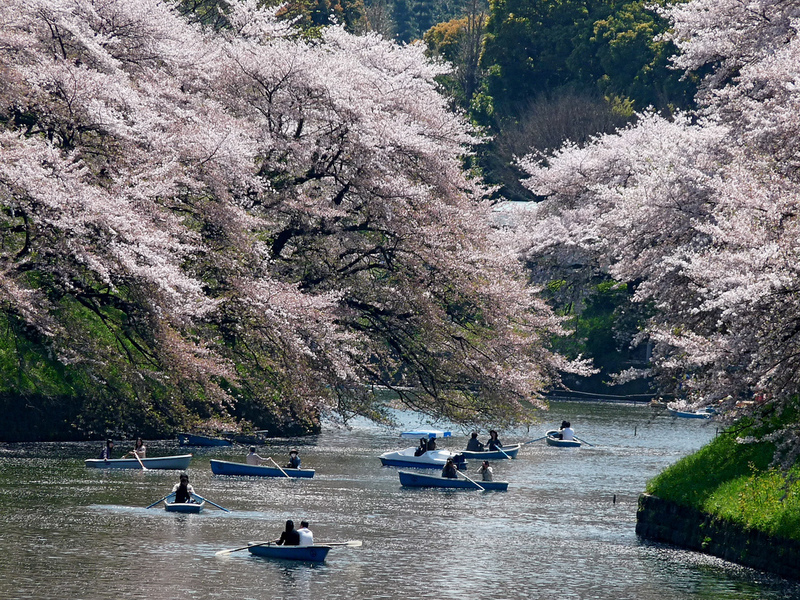 A splendid way to view the blossoms is to charter your own rowboat, as is done here in Chiyoda, Tokyo. Night viewing of sakura is known as yozakura. 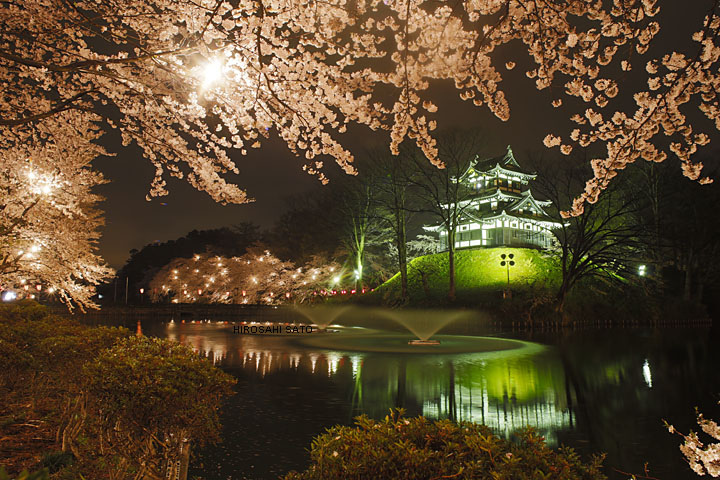 Places like Takada Castle Park in Niigata Prefecture light up their bloomage for night time beauty and associated revelry. 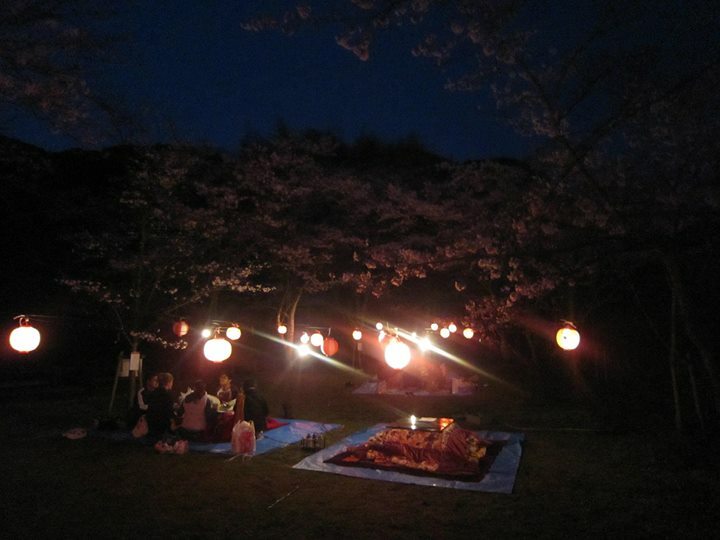 Hanami parties often last well into the night, like this one in Matsubara. If you’re enviously wishing you were on a flight to Japan right now, never fear. 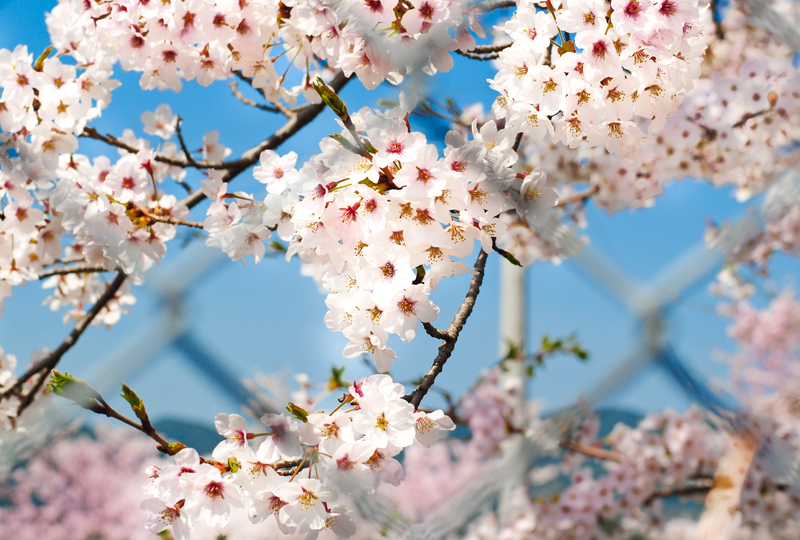 We think it’s about time we brought the spirit of Hanami to good old Blighty. 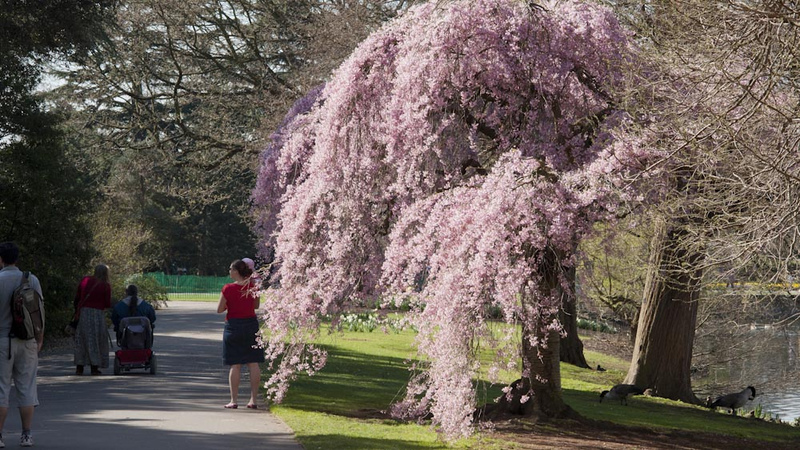 Whip out an old blue tarp (obligatory for cherry blossom parties) and get on down to Kew Gardens, where blossoms like the one below can be found aplenty. Arigatou to Sue Ann, Becca Edwards, Carly Louise, Myself and the good people of flickr for their great pics. 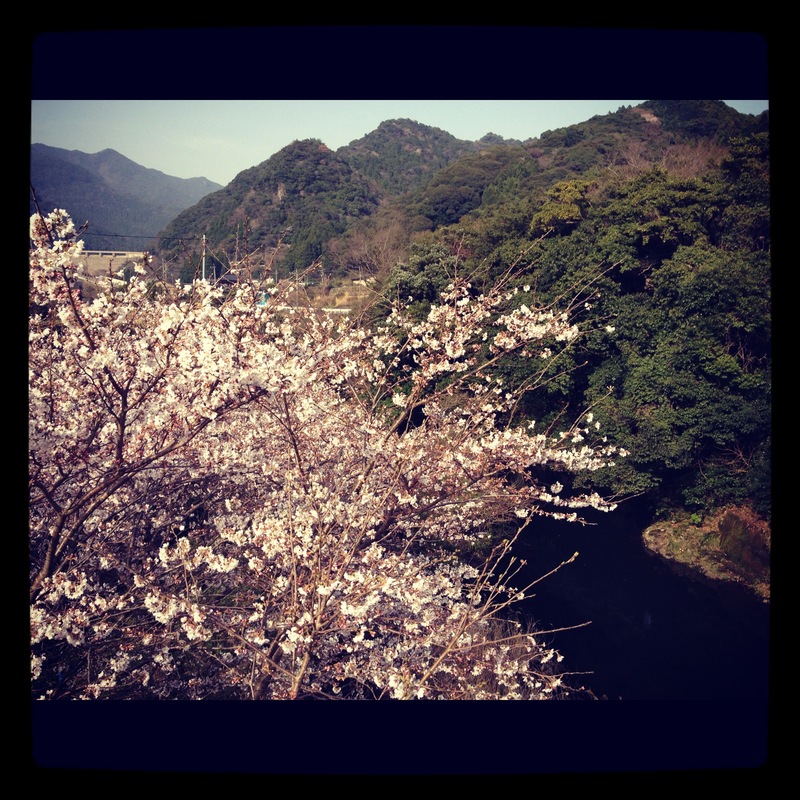 Posted in Travel and tagged cherry blossoms, hanami, sakura. Bookmark the permalink.